American furniture and accessories of the 18th and early 19th centuries, as well as a selection of early schoolgirl samplers, silk embroidered pictures and early canvas-work.On-site needlework conservation services. Online, at shows, showroom and conservation hours by appointment. 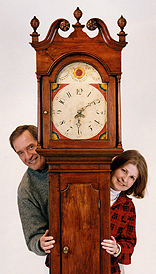 PROPRIETORS Ruth Van Tassel and Don Baumann have been partners in the antiques field and in life for over twenty-five years. 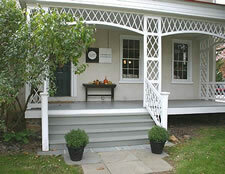 In that time Quite a few of their discoveries have found a place in the finest private collections as well as in prominent institutions including The Metropolitan Museum, Winterthur, Independence Historic Park, The Heritage Center Museum of Lancaster County, the Ackworth School Estates Park in England and The Westmoreland Museum. Ruth and Don's focus on American furniture and antique needlework samplers has allowed them to accumulate much information on these subjects. They always look forward to learning something new and exchanging information with interested parties. RUTH VAN TASSEL is a skilled and very experienced needlework conservator and over the past fifteen years has handled hundreds of antique samplers for both private collections and museums. 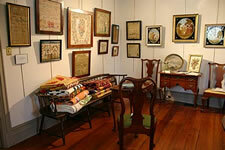 SAMPLER AND NEEDLEWORK CONSERVATION is an in-house service we offer including cleaning, mounting, and framing. 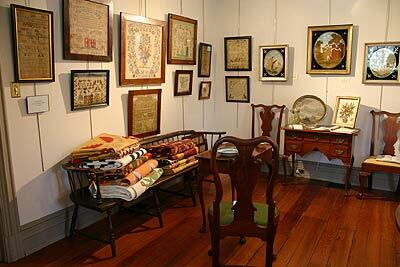 We are always happy to see your antique sampler and give a condition analysis and casual appraisal. Ruth enjoys sharing her knowledge of sampler conservation and antique needlework in general and she regularly makes presentations at shows, museums, and historical organizations. DON BAUMANN grew up in a family of artists and collectors. 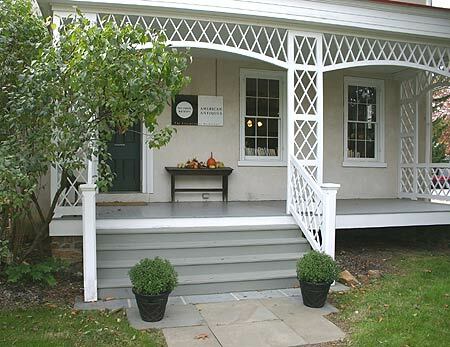 He was introduced to antiques as a child traveling with his parents from shop to shop in Bucks County, Pa. His interest in the objects and the dealers and collectors who pursue them has grown over the years into an active business, one that Don likes to think of as an ongoing treasure hunt. At the Van Tassel Baumann gallery, OUR FOCUS IS ALWAYS ON YOU, THE CUSTOMER and your complete comfort and satisfaction. SALES ARE ALWAYS ON APPROVAL AND UNCONDITIONALLY GUARANTEED*. A complete description of each item is provided including condition, Approximate age, and place of origin. Returns for full refund may be made within two weeks of purchase date. Layaway plans are available for most items. Shipping, packaging, and insurance to all U.S. destinations can be arranged. *Please note that discounted and sale priced items and sales to the trade are final.